CHARLESTON — The might of the Heart of Illinois Conference — led by the GCMS High School duo of Sydni Meunier and Angel Gaesser — was displayed in all its glory during the Class 1A preliminaries of the 40th girls state track meet at O’Brien Stadium on Thursday. The HOIC fireworks hit a crescendo in the 1,600-meter run with the Notre Dame-bound Meunier, the defending champion, posting the top preliminary time of 4 minutes, 50.75 seconds to break the 1984 Pantagraph area record of 4:51.44 set by Bloomington’s Melissa Straza. Earlier, Meunier, the reigning 800 champion, faced Gaesser, the 2011 runner-up, in the third heat. They were even with 100 to go when Gaesser pulled away for the day’s top qualifying time of 2:11.85 while Meunier advanced second in 2:12.32. Both destroyed Meunier’s school record of 2:14.31 with Gaesser’s time ranking fifth in area history while Meunier moved to No. 8 in area annals. They were among 17 area individuals (13 from the HOIC) and eight relays (five from the HOIC) to advance to Saturday’s 10 a.m. finals. Also advancing No. 1 was Tremont long jumper Amelia Glueck at 17 feet, 8¼ inches. The prospects for GCMS to land one of the three team trophies gained ground as the Falcons secured nine scoring opportunities for Saturday. “We got everyone in we were hoping and even a little bit more,” said GCMS coach Erica Kostoff, who also got school records from her No. 1-qualifying 1,600 relay (4:01.01) and No. 4-advancing 400 relay (50.07). Meunier went after the 1A meet record of 4:46.74 in the 1,600, but had no one to push her. “I gave it all I had on the straight so I’m happy with that,” said Meunier, who reached halfway in 2:25.8. She doesn’t plan to run for time Saturday, only the win so she can save energy for the 1,600 relay. She and Gaesser both felt they could have gone faster in the 800. Gaesser’s time shocked even her. In the 1,600 relay, Jordyn Nettleton (63.1) and LaToya Baillie (62.0) got the baton to Meunier in fourth. Her 58.8 leg moved the Falcons to second from where Gaesser blazed 57.1 into first. Gaesser, who advanced fourth in the triple jump (34-0½), also ran in the 400 relay with Jess Meyer, Lauren Nagle and Nettleton. Nettleton advanced sixth in the 300 hurdles (46.85) and eighth in the 100 hurdles (16.14) while twin, Jaymi, pole vaulted 9-6 to advance. Tremont’s Glueck also advanced fifth in the 100 (12.72) and rolled across the finish line after falling in the 300 hurdles to advance ninth (47.32). Two-time defending 400 champion Kalla Gold of Eureka, slowed this year by turf toe and flu, advanced third in 58.36 and anchored the No. 3-qualifying 1,600 relay to a season best of 4:03.07. Preceding Gold’s 59.6 were Shelby Kupferschmid (62.1), Quincy McSweeney (62.4) and Jacey Hartman (58.8). 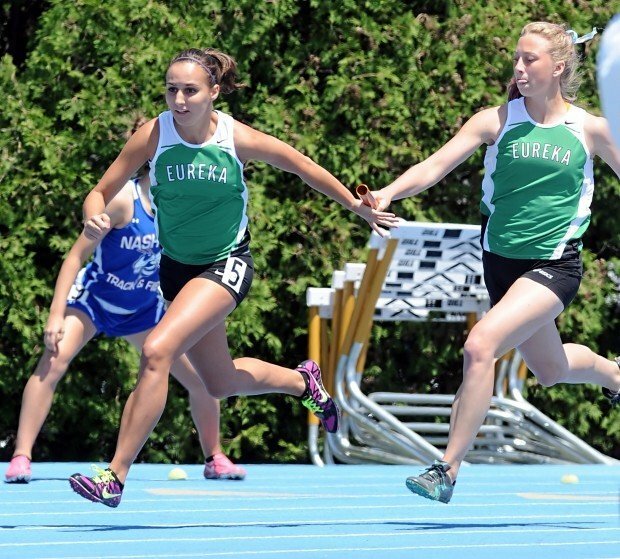 Eureka’s two-time defending champion 1,600 relay trailed only GCMS and Moweaqua Central A&M (4:02.91). Gold anchored her 400 relay to the No. 2 qualifying time of 49.35, tying the fifth-best mark in area history. Joining her were Taylor Krile, Kupferschmid and Hartman. The only team faster was South Holland Seton Academy at 48.92. The area’s six qualifiers to the 12-woman 800 final included heat winners Kristen Paris of Fisher in a school-record 2:15.47 and Kaley Ummel of Lexington in 2:17.35, whose times ranked third and fifth. Also advancing were Delavan’s Maddison Zimmer (seventh, 2:18.93) and El Paso-Gridley’s Julie James (ninth, 2:20.10). In the 1,600, Paris advanced seventh (5:14.77) and Ummel eighth (5:15.45). “That 1,600 was difficult for me because right after the 800 I started sneezing and coughing a bunch,” Paris said. Fisher’s No. 2-seeded long jumper Carli Clifton, as she did in the sectional, opened with two fouls before posting the day’s No. 4 leap of 17-4. She hopes to break her school record of 17-10 on Saturday. “It was definitely a relief because I wanted to make the finals,” said Clifton, who also advanced eighth in the triple jump (33-5). Tremont’s 3,200 relay advanced fifth in a school-record 9:46.45 thanks to Haley Miller (2:26.2), Sam O’Connor (2:27.3), Hannah Finnegan (2:32.5) and Haley Bolliger (2:20.9). Advancing eighth was Eureka (9:55.51) with Valerie Knapp (2:27.2), Kinsey Herman (2:29.9), Kelsey Young (2:316) and McSweeney (2:26.1). Advancing with school records in the 1,600 relay were Lexington (eighth, 4:06.01) and Deer Creek-Mackinaw (ninth, 4:06.68). Lexington’s crew comprised Taylor Winterland (60.3), Ummel (60.6), Lexi Leake (63.5) and Sydney Freed (60.0). The Chiefs ran Becca Johnson (60.3), Sarah Lizenby (61.4), Jessie Graham (62.0) and Calan Johnson (61.9). Rounding out the area qualifiers were EPG’s Mattie Buchanan in the shot put (seventh, 37-7 ¼), Fieldcrest’s Maria Baldwin in the 1,600 (12th, 5:19.65) and Tessa Holland in the high jump (5-2), and pole vaulters Kacy Murphy of Dwight (9-6) and Zoe Gossmeyer of Tremont (9-6).